Mesh and shade tarps are great for creating outdoor gathering spaces made comfortable by protecting them from direct sunlight. Perhaps you found your own tarps invaluable this summer. Well, September has arrived. That means it will not be long before cooler weather as you spend more time indoors. It also means that it is time to start thinking about how you are going to store your mesh tarps for the winter. High-quality mesh or shade tarps from Mytee Products should give you years of reliable service as long as you take care of it. How you store your tarps plays a role in determining how long they last. So its important to make sure you do it right. It is always a good idea to clean tarps before storing them away. Surface dirt can stain if it isn’t cleaned off prior to folding, and any mold, mildew, or algae present when you take a shade tarp down will be encouraged to grow over the winter if you don’t eliminate it. In short, you should clean your mesh tarps before storing. A mild cleaning solution and a soft brush should do the trick. You can lay a tarp flat on the ground or drape it over a laundry line for cleaning purposes. Make sure it is completely dry before you fold it. Although mending is not absolutely necessary before winter storage, it is a good idea to make any necessary repairs while a tarp is easily accessible. You have your tarps spread on the ground or draped across a laundry line, so now is an appropriate time to make those repairs. Minor repairs can be made with a commercial repair product available from Mytee Products or your local DIY store. Major repairs, like torn seams for example, may require you to break out the needle and thread. Do some online research if you are not sure how repair the damage you are looking at. When you’re finally ready to fold your tarps for storage, spread them on the ground or the garage floor. Get someone else to help you fold from corner to corner in a flat, straight line. The more flat and square you can get your tarps folded, the easier they will be to store. They will also be easier to unfold come spring. Where you store your mesh and shade tarps is perhaps the most critical decision of all. First and foremost, you want to make sure they are not exposed to moisture in any way. Moisture is a big problem in the winter months because it expands and contracts with the temperature changes. Any moisture trapped in a tarp could cause damage should it freeze. Moisture can also promote algae growth during the fall and spring. If you have a protected interior space – whether it be a garage, barn, basement, etc. – this would be an ideal space for storage. Leaving your tarps outdoors exposes them to animals even if they are under some sort of protection from the weather. Remember that critters can get into small spaces fairly easily. Lastly, never store mesh tarps in any location where they could be exposed to open flame. Keep them away from flammable liquids as well. Tarp material is treated to be flame retardant, but I can still be damaged by the heat of an open flame if the material gets too close. When storing your tarps for the winter, remember this one thing: if you take care of them, they will provide you with years of reliable service. The mesh tarps we sell at Mytee have a lot of great uses around the home, including providing shade on those sunny summer days. We sell a lot of these tarps to construction companies as well. They are used as privacy barriers during both building and road construction. As a flatbed truck driver, you might be interested to know that mesh tarps can be very helpful to your job. Covering a load of sod is not necessarily to protect it from the weather or flying debris. It is really just to keep everything in place during the trip. The challenge with sod is preventing the sun from cooking it during transport. That’s where mesh tarps come in handy. A steel or lumber tarp would trap too much heat underneath, heat that could kill grass before it ever reaches its destination. And because sod is so fragile, truckers just cannot afford to take chances.Mesh tarps keep everything in place, while still allowing plenty of air circulation. Flatbed truckers face the same challenges with tree loads that come with hauling sod. They need to use tarps to keep everything in place during transport, but lumber and steel tarps can cook trees. Mesh tarps are the solution. It is also interesting to note that tree loads do not usually have to go great distances. They spend less time under tarps as a result. Some agricultural products stacked in crates are better served by steel tarps that can keep the weather out. But like sod and trees, other agricultural products are terribly sensitive to heat. Fresh fruits and vegetables immediately come to mind. A truck driver may load crates of fresh produce and then cover the stack with a couple of mesh tarps to prevent any of the product from flying off during transport. The produce can breathe during transport, reducing the risk of spoilage. Transporting beehives is interesting, to say the least. Most times, beekeepers do not need their hives covered during transport because the bees are sedated. But a trip that is longer than usual may require tarping. Once again, mesh tarps are the ideal solution. They allow the hives to get plenty of air while still keeping everything in place. Using mesh tarps to cover construction materials isn’t routine, but the need does arise from time to time. Think of things like expensive slate tiles or imported paver stones. These kinds of materials are usually wrapped in plastic after being placed on skids. 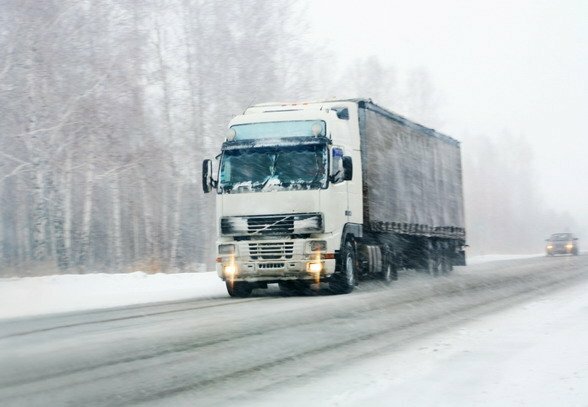 The plastic keeps everything in place, but shippers may ask for a tarp just to prevent any road debris from coming in direct contact with the load. A mesh tarp will do the trick. Truckers prefer the mesh tarp for these loads because it is lighter and easier to apply. Mytee Products carries high-quality mesh tarps in different sizes and colors. We even have purpose-built mesh tarps made just for bee hauling. 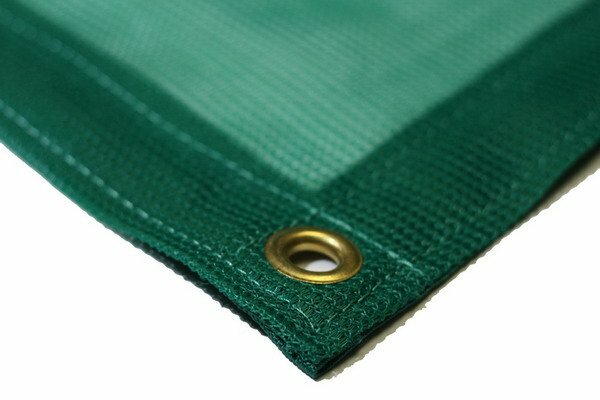 You can browse the entire inventory of mesh tarps we carry in our online store. Rest assured that every product we sell is manufactured to the highest standards of quality in accordance with all regulations. When you purchase from Mytee, you are purchasing cargo control equipment and supplies you know you can rely on. Flatbed truck drivers are not the only ones requiring an ample supply of tarps. Dump truck drivers need tarps to secure their loads too. We recommend mesh tarps for dump truck and trailer loads rather than solid poly or canvas tarps. Why? We will explain the reason in this post. Our heavy-duty PVC mesh tarps have been specifically designed for dump trucks and trailers. They are your best bet for securing loads whether you apply tarps manually or use a mechanical tarping system. The first question to ask is why dump truck drivers use mesh tarps. The answer is simple: federal and state regulations require that all loads being carried by commercial vehicles be properly secured en route. Even though a dump truck might be carrying gravel, stone, or in aggregate material, that material must be kept secure. Federal regulations require that all dump truck loads be kept in place so as to prevent debris from flying off and striking another vehicle. However, please note that federal regulations only apply to vehicles involved in interstate travel. That’s why the states have their own regulations for cargo control. In many cases, state regulations are either identical or very close to their federal counterparts. In the simplest possible terms, any load being transported in a dump truck or trailer has to be prevented from causing damage to other vehicles. The easiest way to do this is to simply cover the load with a tarp. Mesh tarps are the perfect choice because these provide adequate load control without the need for keeping the elements out. PVC mesh tarps specifically made for dump trucks and trailers are durable and reliable enough for even the toughest jobs. Our mesh tarps are made with the heavy-duty PVC-coated vinyl for maximum durability. Tarps include 6-inch vinyl pockets, tough brass grommets installed at 2 foot intervals, and webbing-reinforced seams. While some dump truck operators use generic blue poly tarps purchased at the hardware store, we still recommend purpose built mesh tarps. These are going to last much longer. PVC mesh tarps are also less likely to develop mold and mildew because they are highly breathable, unlike generic blue tarps. Another great benefit of PVC mesh tarps is that they are lightweight and flexible. Their lighter weight makes it easier to affix them to tarping systems as compared to solid poly tarps. They are easier to handle even if you tarp your loads by hand. As far as flexibility is concerned, a PVC mesh tarp rolls and unrolls easily. Mesh tarps are flexible enough that they do not tend to bunch up or get tangled in tarping systems either. They roll out and back up again with very little effort. Last but not least is the fact that PVC mesh tarps for dump trucks are made to be used with most standard tarping systems. That’s why we market these tarps as purpose built for dump trucks and trailers. Why does this matter? Just try fitting a generic blue tarp to your tarping system and you will quickly figure it out. Tarping a dump truck load is supposed to be as effortless as possible. Fitting your tarping system with a purpose-built tarp designed specifically for that use ensures easy and reliable operation. You will not be fighting your tarp with every load. Mesh tarps are the perfect solution for dump trucks and trailers. If you are not using them on your rig, now is a good time to change that.